In the summer of 2017, my team and I kickstarted a Digital Farm Lab. Our mission was to improve food security by bringing agricultural production into the digital age. To do this, we were going to start by building something called the Personal Food Computer (TM) — a controlled-environment agriculture technology platform — from the Open Agriculture Initiative. But despite our efforts, as events unfolded we encountered too many setbacks. And in the end our team ran out of steam. After long reflection, I am closing the Digital Farm Lab and Urban AgTech. We had a good run folks and I am immensely grateful for all of it. In the wake of this end, I want to recount the biggest challenges my team and I faced and the lessons I learned from them. Perhaps these lessons will be helpful for you as they are for me. The Personal Food Computer (PFC) is an open source hardware project, meaning all of the information needed to build the platform is openly available to anyone. The project is led by the Open Agriculture Initiative (OpenAg) and its community meets at the OpenAg forum. In collaboration with the community, OpenAg builds the PFC. Open source is a powerful concept and has proved successful as seen by, for example, Arduino and Linux. However, open source is also challenging. Changes to the project will happen around you since others are developing it. And, since others are developing the project, the problems and bugs you encounter may not be easily understood since you may not have built what is causing the problem. For our PFC, “Kynes” (named after the planetary ecologist and leader of the Fremen, Liet Kynes, from the fiction story Dune), the team and I could never get the software, the openag_brain, to work. Even after spending hours and weeks troubleshooting the bugs and reaching out to the community, Kynes could not run properly for more than a day. This meant we could not build the tools we hoped to, such as climate data visualizations for a plant’s grow cycle or remote monitoring. These tools were necessary for us to fulfill our Kickstarter rewards. Since then the brain has been rebuilt by OpenAg, partly to address the bugs we encountered. This proved to have a significant effect on our work. It meant that the brain we were working with was no longer actively developed and supported. If we were to continue working with the community, we would need to learn how this new brain worked. In the context of available time and money, this change was a heavy setback. Understandably, the project is young and in constant, rapid development. Keeping up with the pace of change is a necessary part of the work. Unfortunately, my team and I could not keep up. After finishing building Kynes and while working on the brain, we took a moment to put our own brains together to plan where we would go next with the project. But finding a direction was tough. We already built Kynes and therefore looked at problems through the lens of our already-built-prototype solution. In other words, we had a solution looking for a problem. Typically, when building a product or service, start-up wisdom urges the entrepreneur to define the problem to a certain level of detail before solutions are even proposed. Though we did define problems in our Kickstarter, these problems were still too lofty and broad. 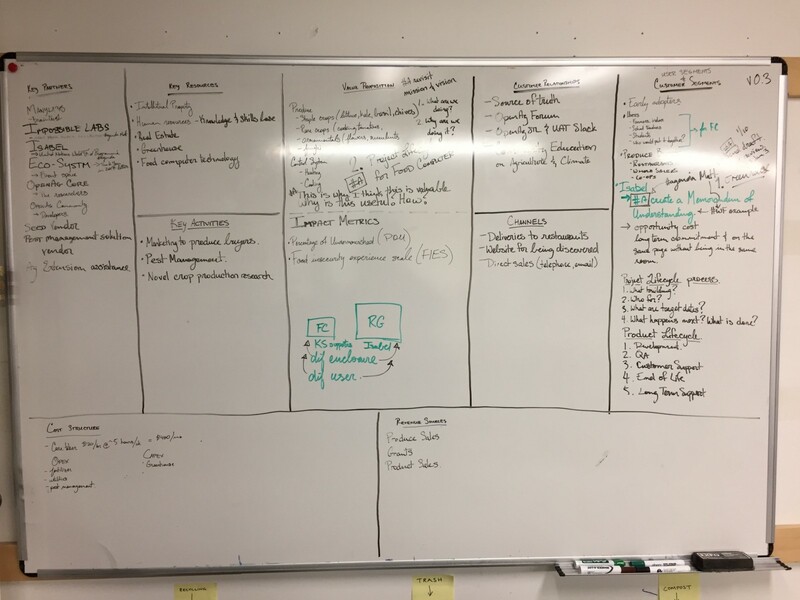 Before developing any hypotheses on a business model canvas or at least even having an idea of potential customer segments and their problems, we already invested in a solution. Being in this position put the proverbial cart before the horse. It takes a team to build a project. It takes a project to build a team. Working with agriculture and technology is interdisciplinary and exciting. By bringing growers together with technologists, we could make use of the powerful information technology tools available today for agriculture. These tools could help growers make more informed decisions; uncover inefficiencies; and come up with new, novel plant grows with controlled environments. 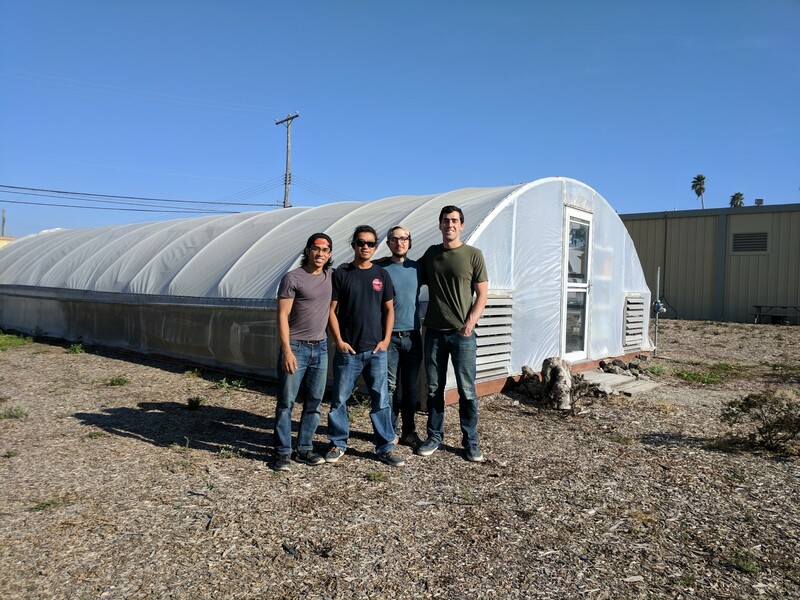 The Digital Farm Lab team consisted of three engineers and a data scientist. Although, we were lacking someone with a plant science background, we thought we had enough to start the project. We could meet a plant science person along the way. But, the technical and business challenges I described above gradually eroded our initial enthusiasm. We could not troubleshoot the brain, we had a solution looking for a problem, and (not discussed in this post) our greenhouse grows kept failing. As the project stalled, it became difficult to find others who would be energized to join our project. Should we work “on” the business or “in” the business? Juggling between making the project work and having enough foresight to plan where to go next is a tight-rope walk. If the project doesn’t work out, then the plans cannot be realized. If there is no plan, then we are purely reactionary without direction. Looking back, I am not sure if I should have worked more on planning or more on design and engineering. I suspect the answer is that I should have done both and that is why entrepreneurship is hard. were no longer conversational thought experiments but challenges I faced. For a time, we did rise to meet those challenges. 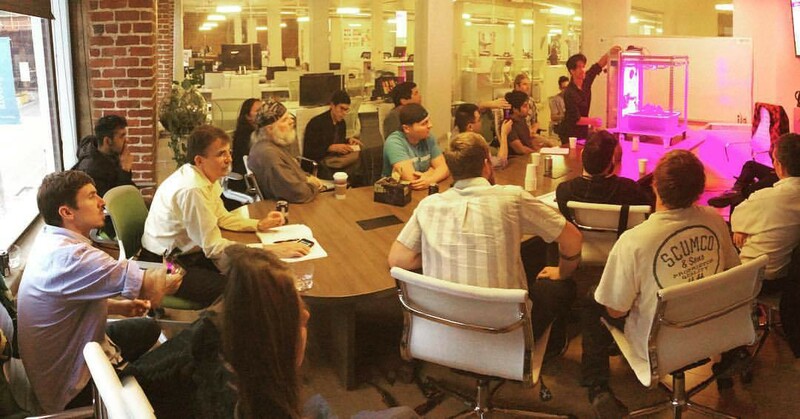 We did create an engaging meetup; the Urban AgTech meetup has a five-star rating. We did come together, launch a successful Kickstarter, and build a project. I am moved and inspired by the power in bringing people together. As an engineer, the main takeaway I have from building the food computer and meeting fellow entrepreneurs through this project is the needs of mechanical engineering for not only growing plants indoors but also for sustainability. 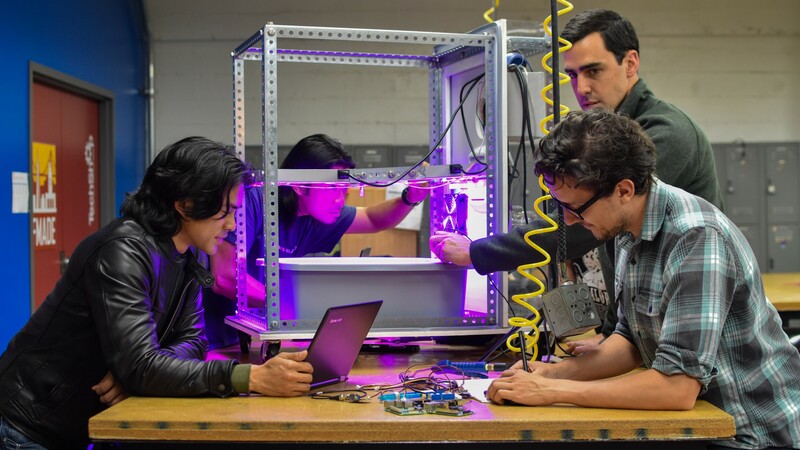 Through this project, for example, I learned how mechanical engineers are needed to improve the energy performance of indoor agriculture facilities and of buildings generally. I also learned refrigeration management is the number one solution determined by the Drawdown project to reverse global warming. But living so close to Silicon Valley, the pull to focus on information technology and software-based solutions is strong, which is largely why I worked on the food computer project. However, my education and training made me an engineer for the built environment. My projects are building-sized not desktop-sized. My collaborators are more architects, structural engineers, and city planners than data architects, hardware engineers, and product designers. This is the most important lesson I learned — rather than cast aside who I am and what I know, I must embrace my strengths. Doing so will better equip me to solve the nuanced challenges I will inevitably face as I go deeper into a entrepreneurial pursuit. Now that this project is over, I see that I have the opportunity to do so and become more thoroughly myself in a way that no one else can. By embracing who I am, I can offer a unique, valuable contribution that we need on the road to sustainability. One of Thomas Edison’s first inventions was a vote recorder, it was never used. Richard Branson almost went to jail for tax evasion as chronicled in his book Losing My Virginity. Apoorva Mehta launched 20 failed startups before he started Instacart. What separates successful entrepreneurs from unsuccessful ones is their will to be resilient and their audacity to try again. Over the next year, I will be reorienting myself for my next attempt. But this time, I will do something that is more true to who I am professionally — an engineer for the built environment. Starting with this post, I will be recording my journey. If you’re interested in following my journey into mechanical engineering and sustainability, feel free to “follow” me on Medium. And if you want to meet up in the Bay Area to talk about these subjects, send me a message! I’m in a talking mood right now.